Research in educational psychology has led to substantial improvements in our knowledge about strategies for instruction: teaching and learning. We now have a better undertsanding of how the brain shifts information from our short term to our long term memory. Planning a purposeful and intentional lesson around strategies for instruction that promote memory and retrieval of information has become a key component in lesson design. Using the following five strategies to anchor your lesson will help students retrieve information in a meaningful way. Researchers have identified strategies for instruction that can be taught by teachers and used by students to significantly improve the quality of student learning. Teachers should model instruction, provide opportunities for discovery, and allow time for mastery through multiple opportunities for guided practice. 1) Activating Strategy to hook the learner. This includes an Advance Organizer with an Essential Question and Key Vocabulary. The Essential Question helps the teacher and students focus on a clear objective/standard. Students need to know the purpose of the lesson and what their take aways should be. A hook builds and links prior knowledge and brings the learner into the lesson by offering an activity to spark interest. It should offer students an opportunity for academic discourse to help them uncover what they already know and/or what mental models they may have about a particular subject. This can be done as young as kindergarten up towards a college level. 2) Vocabulary Strategy that is specific and embedded throughout the lesson. It should even be embedded in the Essential Question. 1. Teacher has assessed the vocabulary load of the text to be read for the lesson. 2. New words are selected from the text for this lesson. 3. Relevant words from previous lessons are included in the lesson. 4. Relevant words from a schoolwide list of cross-cutting words are included in the lesson. 3) Organizing Strategy that includes Vocabulary and Graphic Organizers. Organizers help students make sense of their learn through sorting information which is an intuitive piece of the learning process. Teacher allows for a variety of guided practice and sorting formats to provide multiple opportunities for a variety of learning styles. This can be done whole group, small group and/or independently and may even be a combination of these depending on the characteristics of the learners in your classroom. 4) Cognitive Strategy with Pre-planned Purposeful Higher Order Thinking, Vocabulary and an Authentic Writing Task (Teacher uses formal written assessments to document student understanding). Teacher encourages students to demonstrate understanding of word meaning through a variety of oral and written activities embedded into the content lesson. Timely, continual and meaningful feedback is important to growing the cognitive process. 5) Summary Strategy that distributes summarizing and Vocabulary throughout the lesson not just the end. Distributive summary helps the teacher monitor for understanding throughout the lesson and make adjustments throughout. The lesson plan we provide is a guide to help teachers as they plan. Plan for the lesson, not the day. All of these strategies for instruction may not always be completed in a daily lesson. Adapt, don’t adopt. 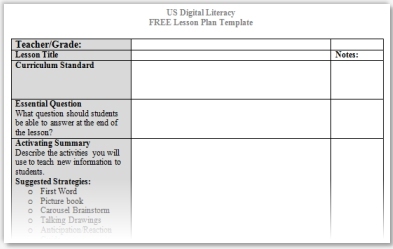 Make the components of this lesson plan work for your classroom. And most importantly, remember the lesson plan is a guide for the teacher. It should be crafted so that the teacher can have it as a reference guide during the lesson. After writing the plan, the teacher will naturally have a-ha’s along the way and may shift the direction of a particular strategy to meet the needs of the students. The teacher knows the students best and should have professional latitude to add/subtract from her intended plan. But also keep in mind that the lesson plan should be written so that another educational professional will be able to follow it. The plan may need to be followed by a substitute teacher for teaching or an administrator for evaluation. Each of the elements listed in the lesson plan template have a dedicated page on this site with a full description of each. 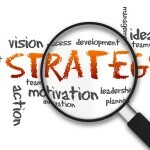 In addition, we have provided analog strategies for each element along with digital strategies. If you scroll down to each page links to the digital sites are included for quick access and review by the teacher. We are constantly adding to and modifying this site with the best strategies and digital sites we see, so check back often for updates. The Researchers at Mid-continent Research for Education and Learning (McRel) analyzed selected studies on instructional strategies that could be used by K-12 teachers in their classrooms. They used a research technique referred to as meta-analysis to combine the results of a given study into a unit of measurement called the effect size. The effect size then could be translated into a percentile gain. An effect size of .20 can be considered small; an effect size of .50 can be considered medium; and an effect size of .80 can be considered large. 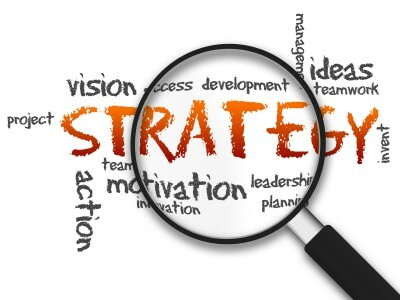 One of the primary goals of the McRel Study was to identify those instructional strategies that have a high probability of enhancing student achievement for all students in all subject areas at all grade levels. These strategies are not meant to be used in isolation to get best results, but rather layered throughout lessons. There are nine categories of strategies that have shown to have a strong effect on student achievement from highest to lowest impact. Identifying Similarities and Differences: Seeing similarities and differences is a fundamental cognitive process (Gentner & Markman, 1994; Medin, Goldstone, & Markman, 1995). As an instructional strategy, it includes various activities that help learners see patterns and make connections. For example, students compare things that are similar and contrast things that express differences. They classify when they identify features or characteristics of a group of objects or ideas, and then develop a scheme to organize those objects. Metaphors are created when two ideas or experiences are compared based on a common underlying structure. Finally, analogies provide another way to identify similarities and make comparisons. Each approach helps the brain process new information, recall it, and learn by overlaying a known pattern onto an unknown one to find similarities and differences. Looking for similarities and differences prompts the learner to consider, “What do I already know that will help me learn this new idea? This fosters relationships and connections to new understanding. Summarizing and Note-Taking: Effective summarizing leads to an increase in student learning. Helping students recognize how information is structured will help them summarize what they read or hear. For example, summarizing of a reading assignment can be more effective when done within summary frames, which typically include a series of questions the teacher provides to direct student attention to specific content (Marzano, Pickering, & Pollock, 2001). Students who can effectively summarize learn to synthesize information, a higher-order thinking skill which includes analyzing information, identifying key concepts, and defining extraneous information. Note taking is a related strategy that teachers use to support student learning. Without explicit instruction in note taking, however, many students simply write down words or phrases word for word, without analysis (or good effect). Successful note-takers summarize to arrive at a nugget of meaning, which they are much more likely to retain. Students also benefit from using their notes as a document of their learning. Teachers can prompt students to review and refine their notes, particularly when it is time to prepare for an exam, write a research paper, or other summative assessment of learning. 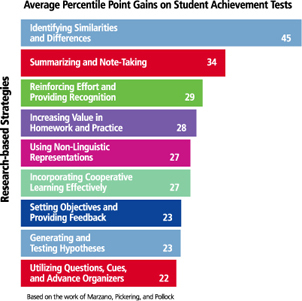 Reinforcing Effort & Providing Recognition: The instructional strategy of reinforcing effort enhances student understanding of the relationship between effort and achievement by addressing their attitudes and beliefs about learning. Success can be attributed to the assistance of others, to luck, to innate abilities, and to effort. It is effort that is the most important as it is the only one within an individual’s control. Research shows that the level of belief in self-efficacy plays a strong role in motivation for learning and achievement. Providing recognition means giving students rewards or praise for accomplishments related to the attainment of a goal. It speaks to the general affective development of students rather than to their specific academic development. Teachers who implement this strategy successfully use recognition to positively influence their students’ attitudes and beliefs about accomplishment. Providing recognition for attainment of specific goals not only enhances achievement, but stimulates motivation. Always ask, “What learning will result from this homework assignment?” The goal of your instruction should be to design homework that results in meaningful learning. Assign homework to help students deepen their understanding of content, practice skills in order to become faster or more proficient, or learn new content on a surface level. Check that students are able to perform required skills and tasks independently before asking them to complete homework assignments. Consider parents and guardians to be your allies when it comes to homework. Understand their constraints, and, when home circumstances present challenges, consider alternative approaches to support students as they complete homework assignments (e.g., before-or after-school programs, additional parent outreach). Because the research on homework is mixed, teachers should think carefully about what tasks they assign for homework, and what the purpose of that homework truly is. Non-Linguistic Representations: are referred to as the imagery mode. Research has shown that when students are engaging in the creation of nonlinguistic representations that this mode stimulates and increases activity in the brain. Nonlinguistic Representations is the most underused instructional strategy even though it has been shown to help students understand content in a whole new way. Each of these activities enhances student learning. Non-Linguistic representations can be Graphic Organizers, Physical Models, Visualizations inclduing Pictures, Images, and Infographs as well as Kinesthetic Learning. Cooperative Learning: requires positive interdependence – sense of sink or swim together, individual accountability – each of us has to contribute and learn, interpersonal skills – communication, trust, leadership, decision making, and conflict resolution, face-to-face promotive interaction, and group processing – reflecting on how well the team is functioning and how to function even better. Cooperative learning is when students work together to accomplish specific shared goals. Learning occurs when positive structures are in place to support (norms and expectations) that learning. In order to be productive employees in the future, students need to learn to work cooperatively towards a common goal or product. Research indicates using cooperative learning groups at least once a week has significant effect on learning. It also indicates group learning is most effective in heterogeneous groups. Cooperative grouping simultaneously achieves diverse outcomes such as increased achievement, time on task, motivation, and transfer of learning. Yet group learning is ineffective when support structures not in place. The teacher has to structire norms and high expecations for cooperarive learning. How do I know they got it? What do I do when they don’t? What do I do when they do? Teachers should set “standards-based” goals for a unit and encourage students to set personal learning goals on how they’ll achieve them. Teachers should also communicate learning objectives to parents so they can provide appropriate support to students. Feedback should be evidence rich. Rather than say “Great job”, the teacher should say “Wow, I like how you have mastered your nultiplication facts up to 5’s! I can’t wait for you to show me that you have learned your 6’s next week! Awesome multiplication mastery!” The teacher should use various methods of assessment. Feedback should be positive yet corrective in nature. Feedback must be timely feedback. Feedback should be specific to criterion. And the highly underused technique of self-assessment should often be used to gauge progress. It is not just for science class! Research shows that a deductive approach works best, but both inductive and deductive reasoning can help students understand and relate to the material. Ask students to predict what would happen if an aspect of a familiar system, such as the government or transportation, were changed. Ask students to build something using limited resources. This task generates questions and hypotheses about what may or may not work. Utilizing Questions, Cues and Advance Organizers: Research indicates cues are explicit reminders about what a student is about to experience, questions help students analyze what they already know, and advance organizers help students retrieve what they know about a topic and focus on the new information. These are usually most effective when used before a specific lesson. Pause briefly after asking a question to give students time to answer with more depth. Vary the style of advance organizer used: Tell a story, skim a text, or create a graphic image. There are many ways to expose students to information before they “learn” it. Showing video clips, sharing related texts in small groups, previewing a lesson before actually delivering it, embedding selected vocabulary in other lessons prior to teaching the lesson are just a few ways to expose students to new information. Strategies for instruction as well as Marzano’s Research Based Strategies will help teachers build 21st Century lesson plans. Meaningful learning happens with intentional and purposeful planning. These lessons will be an important anchor in teacher directed instruction that will be supplemented with small group lessons that provide reteaching and interventions to selected students.